This listener had very kind words for Voudouris' first record, and this one does not disappoint expectations. Like the earlier release, this collects four novel explorations of computer processing. Like Iannis Xenakis or John Cage, Voudouris excels at transforming some data set from the world into material that is used for his compositions. For example, the piece “UVIVI” uses data gathered from traffic patterns around a pothole on a road in Mozambique to create a mass of computer-generated sirens of various pitches and densities. One can't help but to compare the sound to Xenakis' UPIC program, a complex synthetic sound, rich but not at all harmonic. That is as easy to comprehend as it gets, the three other pieces are based on more inexplicable and creative strategies. “ΑΛΘ=Φ” uses speech synthesis to “attach a language to emotions, an area that normal language fails, at the same time attempting to address an emergency in a world where imperfection is becoming less tolerable to social pressure.” These sounds, sometimes sounding like voices, sometimes like horns, sometimes like electronic noise, are then routed through a sixty foot by sixty foot performance space in which twenty-four “robot” loudspeakers listen to the other robots and adjust their position/volume accordingly. 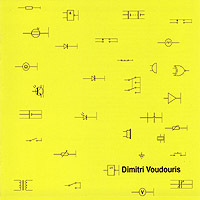 Voudouris explains the situation in much more theoretical and technical detail on his web site. What we hear, and I don't know if it is the signal routed to the robot speakers, what the robot speakers hear, or a stereo mix of what transpires in the performance space, is a swarming mass of noises. I am reminded of Eric Cordier's masterpiece Stéllaire Holostée in which sounds are sent to hundreds of wall-mounted speakers and what we hear (on the CD) is the signal sent to the speakers, not the sound of the speakers rattling against the walls. Complex, heterodox, scientific... this is an amazing production of new sounds and ideas.